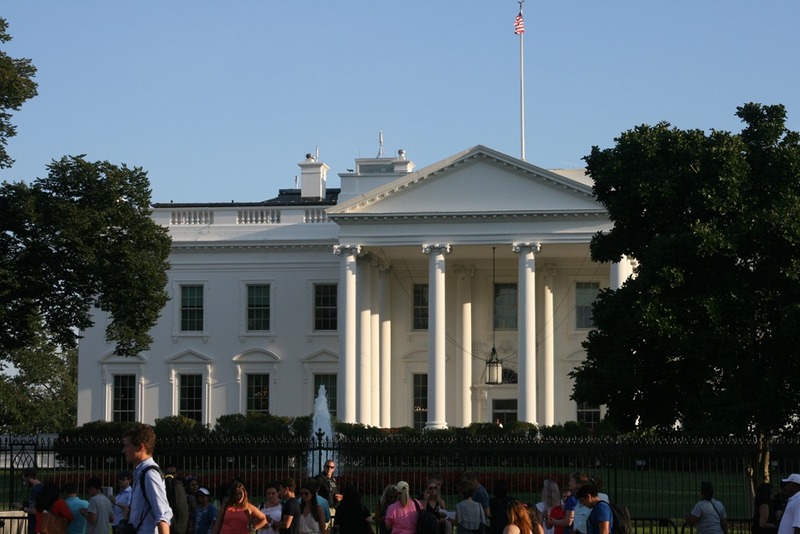 It’s time for another episode of “Where did the Perrows go?”, also known as “How does Graeme remember all this stuff?” or “You don’t expect me to read all this, do you?” Today, we’re going to the nation’s capital – no, not Ottawa, the capital of our neighbours to the south: Washington, DC. In August of 2016, the four of us drove down to DC for four days of sightseeing. Although much shorter than the 2+ weeks in Florida in 2014, France in 2008, and the UK in 2009, this was a very fun trip and we all had a great time. As per usual, here’s the breakdown of where we went and what we saw. If you’re on Facebook, you should be able to see this photo album of the trip. Incidentally, Graeme remembers all this stuff because he brings a notebook with him on vacation and writes it all down every night. Otherwise this article would be much shorter. Our first day of vacation had nothing to do with Washington other than the fact that we spent the night in the USA. We left around 9:00am, dropped Shadow off at the “B&B” we board him at when we’re away, and drove to Safari Niagara, where we spent the day with my sister Trudy and her four-year-old daughter Liv. Gail and the boys had been there before, last summer, but I had never been and I loved it. It was big but not massive like the Toronto Zoo, and also spread out but not like Marineland where you have to walk for fifteen minutes before you see anything. 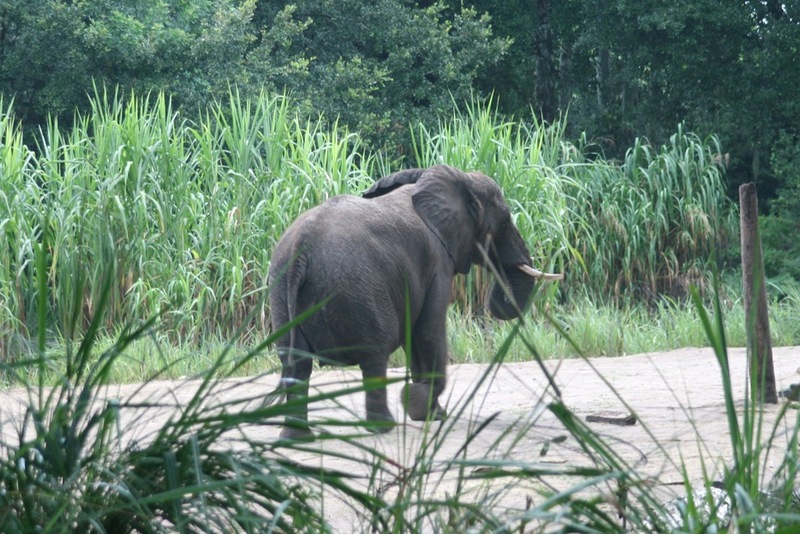 We saw flamingos, eagles, tigers, lions, gibbons, monkeys, giraffes, camels, kangaroos, and a few others. The gibbons were unbelievably loud – a sign said that in the jungle, they can be heard several kilometers away and we could easily believe it. The highlight for me was the budgie feeding building, where you can buy popsicle sticks covered with sticky stuff and birdseed for $1 each. 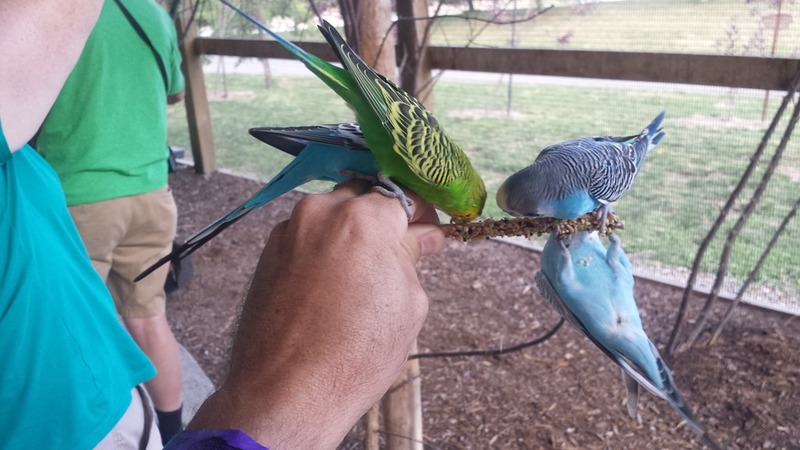 The budgies are very tame and will land on the sticks, your hand, or your arm to eat the seed. Gail even had one land on her head for a few seconds. At one point I must have had eight budgies on the stick, on my hand, and on my arm at one time. Other than the one who thought the freckle on my arm was a seed, this was very cool. After a busy and fun day, we left around 5:30. Trudy and Liv went back home to Toronto while we crossed the border, went to the Olive Garden in Niagara Falls for dinner (and to pick up Ryan’s hat after he left it there back in July), and then checked into our hotel around the corner. We stayed at the Econolodge near the airport, which was a nice enough place. It was relatively expensive but that’s mostly explained by “near the airport”. After a couple of hands of rummy, we plugged the laptop into the hotel TV and watched a bit of Now You See Me (a fun magic/heist movie) before bed. The hotel had complementary breakfast, which was your standard cereal, mini-muffins, yogurt, bread, bagels, etc. No eggs, bacon, sausage, or French toast, but they did have a waffle maker which Nicky made use of. After we ate (back in our room since the tiny little breakfast area was full), we packed up the van and got ready to head out. This is when we realized that the GPS in the van was programmed with maps of Ontario plus only a handful of north-eastern states. These included New York and Pennsylvania (which we used on the Hershey trip last year and Darien Lake this year), but not Maryland or Virginia, so we couldn’t find the next two hotels we’d be staying at. Without a specific travel data plan, enabling data on Bell Canada smartphones while in the US is unbelievably expensive (something like $6 / MB – that’s $6 per megabyte, so $6,000 per gigabyte), so I had bought a $20 package that gave me 200 MB of data for while we were away. But firing up the GPS on my phone for this drive would have eaten through that very quickly, so we set up the maps app on the phone while on the hotel’s wifi, then disconnected with the GPS instructions on the screen. This was a little inconvenient but not a big deal. We drove south through New York and Pennsylvania (I said this in the Hershey article from last year but it’s still true. The highway in New York was terribly bumpy and loud but the second we crossed the border into PA, it was smooth and quiet), stopping for lunch at a Subway in Ridgeway, PA. The boys had brought a bunch of movies to watch on the drive, but were in the middle of bingeing Star Trek: The Next Generation so they watched (and Gail and I listened to) numerous season 2 and 3 episodes on the drive down and back. We lost the GPS at the Maryland border but continued on to the Comfort Suites in Hagerstown, arriving around dinner time. We checked in and went to find dinner. We were introduced to a chain called Red Robin on our trip to Hershey last year and we loved it, so we made a point of looking for one. There was one not far away and once again we were not disappointed. After a stop at a local Target for some shopping (snacks for the rest of the trip and the obligatory case of Cherry Coke Zero to take home), we went back to the hotel, finished the movie, played some cards and hit the sack. The Comfort Suites also had complementary breakfast but they had a few more hot options than the Econolodge, including eggs (though Gail suspected they were powdered), sausages and French toast sticks. After breakfast we drove about a hour to the Steven F. Udvar-Hazy Center (there’s a name that just rolls off the tongue), which is an air and space museum run by the Smithsonian near Dulles airport. Note that there is another Smithsonian Air and Space Museum on the National Mall in DC, but we’ll get to that on Friday. This place was awesome. It’s one single massive building containing 170 (!!) planes, some helicopters, a space shuttle, and a bunch of other things like pieces of guided missiles and a collection of plane engines. Some of the planes include a Concorde, the Enola Gay (yes, the Enola Gay, not a replica), and a stealth fighter as well as very old biplanes and triplanes, WWI and WWII fighters and even some German warplanes with swastikas on them. We started in the tower, which is a replica of a real air traffic control tower and gave a great view of Dulles airport and the surrounding area. Then we watched an Imax movie called Journey to Space narrated by Sir Patrick Stewart (I said it was great that they got him to narrate it “because he’s BEEN there, ya know?”) before going into the main part of the museum itself. A tour was just starting so we joined the tour guide. He was clearly retired (he was well over 70) but he knew his stuff, and not just the planes themselves. Someone (possibly Gail) asked how the Stealth fighter got to the speeds that it did and he got right down into the minute details of the engine and how they somehow compressed the engine’s exhaust to increase the speed. I didn’t ask, but I suspect he was a veteran of the Air Force or a Navy pilot or something. The Concorde was a little smaller than I expected, as it only held about 100 (rich) passengers. I would have liked to have been able to look around inside the Concorde but all the planes were strictly outside-only. No doors were open and the windows on the Concorde were far too high (and small) to see inside. We didn’t get quite as good a view of the shuttle Discovery as we did of the shuttle Atlantis at Kennedy Space Center because Atlantis had its cargo bay doors open and was hanging on an angle, whereas Discovery had the doors closed and was sitting on its wheels. It was still awesome to be right next to the actual shuttle. We had a bit of a time limit, so we left around 3:30 and drove about 40 minutes into the city to the hotel for the rest of our trip. This was the Holiday Inn Rosslyn, which was not actually in Washington but in Arlington, Virginia, just across the river. We were on the 9th floor and had a great view of Georgetown. It was actually a conspiracy to kill Lincoln, the vice president, and the Secretary of State, but the other two assassins chickened out. John Wilkes Booth was a very famous actor at the time. It’d be like Ryan Reynolds killing the President. Andrew Johnson took over as President after Lincoln died and was very unpopular. He was impeached with only weeks left in his term because the rest of the government couldn’t wait that long to get rid of him. Lincoln’s son Robert was not there when his father was shot, but eventually became a politician and was there when both James Garfield and William McKinley were shot. While walking down Pennsylvania Avenue, we came across a bunch of roller bladers playing a road hockey game in front of the Treasury building (right next door to the White House). I imagine having Pennsylvania Ave. closed to traffic makes this convenient. After the tour, we walked to the nearby Metro station and returned to Rosslyn and bed. We got up a little early on this day and took the Metro into DC. We were planning to take a tour of the Bureau of Engraving and Printing (i.e. where they print US money). Tickets were free but we had read that they were only available that day, and sometimes were sold out by 9am. We arrived there around 8:30, and once we found the ticket booth, there was no line at all. We had our choice of tickets for any time slot, and decided on 5pm so it wouldn’t break up the day. Once we had our tickets, we walked over to the Smithsonian Castle, the only museum open before 10:00. We had only had a quick breakfast at the hotel and were a little hungry so we stopped at the cafe inside the Castle. There were two or three employees wandering around, but one of them said something like their shift hadn’t started yet (it was about 8:55 at this point), so someone else would help us. We were looking for breakfast sandwiches (eg. egg and sausage on toast) so it wasn’t just something we could pick up from the rack. After waiting for a few minutes while the employees laughed and joked amongst themselves and ignored us, we just said “never mind” and left. This might have been the only example of terrible service we experienced on this trip. A tour was just starting so we went along. I knew the Smithsonian Institution was named for a guy named Smithson, who left a bunch of money to the US Government for the establishment of museums, or something like that, but what I didn’t know was that Smithson was a British scientist and never set foot in the US. It was never even clear why he left the money to the US and not Britain, and the US government debated whether or not to accept the money for many years before they did, and then took another ten years to decide what to do with it. As a bit of an aside, all of the Smithsonian Museums are completely free. There are special exhibits in some of them that cost something, and the Imax and Planetarium shows cost extra too, but the museums themselves are free. After the tour of the Castle, we crossed the Mall and went to the Museum of Natural History. Just like at every other museum we’ve been to on this trip, a tour was just starting as we got there, so we joined in. The tour guide was another retiree who was very knowledgeable, particularly about evolutionary biology, so we picked his brain a lot about the human origins part of the museum. 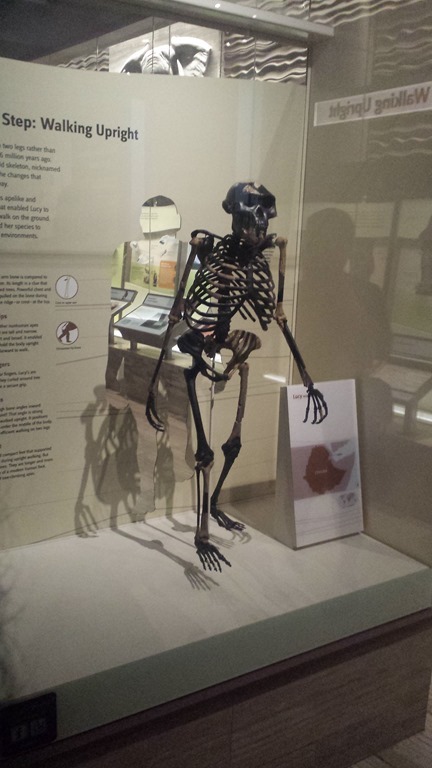 I used to read Owl magazine back when I was a kid (and both my kids did too), and I remember reading about Lucy, the 3 million year-old Australopithicus afarensis skeleton discovered in Africa, so it was kind of exciting to actually see her. I have to say I was a little disappointed to find that it was a replica and not the real Lucy, which is in Ethiopia. But it was still very cool. The tour went through the mammals section, human origins, the ocean, bones, dinosaurs, and ended with gemstones and the Hope Diamond. There was so much to see that after a not-very-cheap lunch at the cafe downstairs, we went back through half of those areas again. We also stopped in a section called Q?rius (pronounced “curious”), which was a science hands-on exhibit aimed at teenagers. Both the boys enjoyed it. It was about 4:00 at this point, so we left the museum to head over to the Bureau of Engraving and Printing for our 5:00 tour. It was very hot out (around 34°C, 93°F) so we hoped we would be able to wait inside once we got there. Unfortunately the doors were locked and we had to wait about 20 minutes, but the line was in the shade so it wasn’t so bad. Eventually we got inside. There were lots of panels on the walls full of information, and we learned a lot. The tour itself was also interesting – they make something like $200 million worth of bills every day, 95% of which is used to replace old bills that are worn or damaged and removed from circulation. They stressed at the beginning of the tour that absolutely no videos or photos can be taken inside, but someone tried anyway. When the tour guide saw this, she immediately stopped and very sternly told the guy to stop, or “security will come and take your camera away”. They don’t mess around here. The tour was only about 20-30 minutes long but pretty fun. After perusing the gift shop briefly, we took the subway back to Rosslyn. One cool thing about the Rosslyn Metro station – the tracks are way underground, so you have to take this super-long escalator down before getting on the train. Wikipedia says the platform is 97 feet below street level, which means the escalator is dropping you almost ten storeys. We had been told of a good local pizza place called Wise Guys, so we bought a large pizza and took it back to the hotel. It was quite greasy but very good. After a couple of card games, the boys and I went for a swim. There was more “hanging out in the pool” than actual swimming, which was good because we had to get rested up for our major walking day on Friday. After the swim, we read for a while before bed. 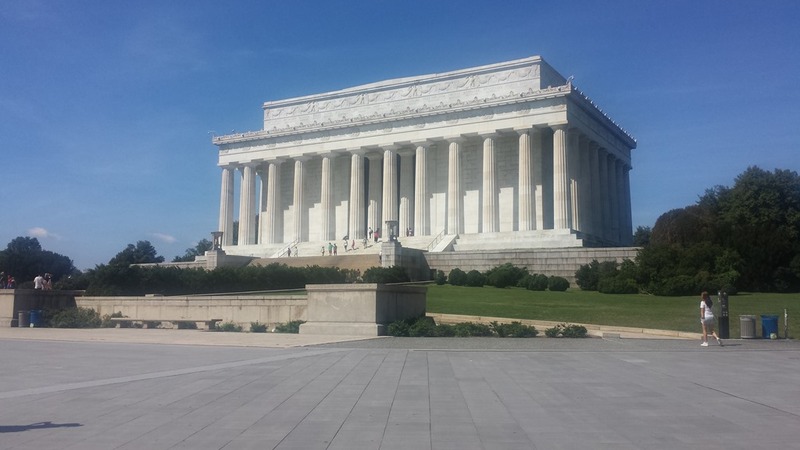 This was the day of our second DC By Foot tour, a four hour walk through the memorials on the Mall and around the Tidal Basin. The tour started at the Washington Monument, which George Washington himself approved, though it didn’t get started for many years after he died. Construction stopped during the Civil War and resumed ten years later, at which point they found that they couldn’t get the same kind of stone as before. When you’re close to the monument, it’s quite obvious that about 1/4 of the way up, the colour of the stone changes dramatically. We walked from there to the World War II memorial, a large circular area with a pillar for each state (and a few non-states including the Puerto Rico and the Philippines), and a huge fountain in the middle. Next was the Vietnam Memorial, which was designed by a 21-year-old student to look like a “wound” in the ground. The names of every US serviceman killed or missing in action (all 58,000+ of them) are etched into the wall, and the wall is reflective so that you can see yourself while looking at the names, bringing the present and past together. I personally know nobody who fought in Vietnam and I’m not even American, but I found the memorial very powerful and moving. Next was the Lincoln Memorial, which was incredible. The building itself is huge and the statue of Abe inside is amazing. The entire Gettysburg Address is carved into one wall, and his second inaugural address is carved into another. From the front, you get a great view of the Mall and Washington Monument (and Capitol building in the distance) and from the back, you can see Arlington National Cemetery across the river. After Lincoln we crossed to the other side of the Mall to the Korean War memorial, which is a set of 19 statues of soldiers as well as a memorial wall similar to the Vietnam one. However instead of names, the faces of hundreds of actual soldiers (from National Archives pictures) are etched into the wall. It is said that one of the faces is Alan Alda from MASH (which took place during the Korean War), and I did see a face that looked like his, but I hope this is coincidental. It seems rather disrespectful to the men and women who actually served in Korea to include the face of someone who only pretended to serve. It is said that no matter where in the memorial you are standing, at least one of the statues is looking at you. The boys and I took this as a challenge but were unable to find anyplace where this wasn’t true. Next was the Martin Luther King memorial. I knew a bit about the man but almost nothing about the memorial, and it turned out to have been quite controversial. A Chinese architect was chosen to build the memorial and it thus it was actually constructed in China and then brought to the US, and a lot of people were unhappy about that. 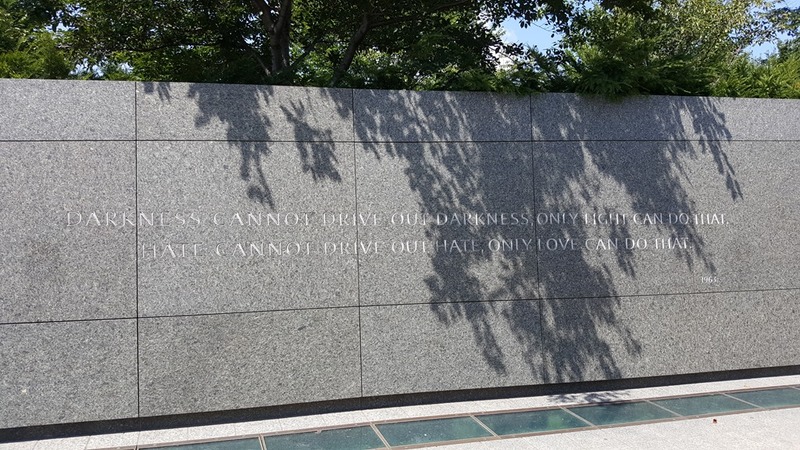 Further, the sculptor decided to add a quote from MLK onto the side of the sculpture, but shortened the quote to make it fit. However shortening the quote actually changed the context of it and people were so unhappy about it that the quote was removed two years later. After the King memorial, we started around the Tidal Basin to the Franklin Delano Roosevelt memorial. FDR was the last President to serve more than two terms; he died shortly into his fourth. He also spend his entire Presidency in a wheelchair thanks to polio, though the public never actually saw the chair because he always had a large cloak draped over himself, covering the chair. The memorial is massive – there are four large “rooms”, one representing each of his terms. Each has a waterfall feature that gets progressively more complex in each room, representing the increasing difficulty of his presidencies in dealing with the Great Depression and World War II. Next was the Jefferson Memorial, another impressive huge marble building, but this one had a bronze sculpture of the President rather than a marble one. This is where the tour ended. We thanked our guide Ingeborg, who did an outstanding job. We were pretty wiped by this point since we had been walking for four hours on one of the hottest days of the year (34°C again). Our next stop was the Air and Space Museum back on the National Mall, so we completed the circle of the Tidal Basin and headed there. After lunch at the (thankfully air conditioned) food court, we walked around the museum for a while, checking out the exhibit on early flight. We then went to the Albert Einstein planetarium for a show called Dark Universe. It was narrated by one of my favourite scientists, Neil DeGrasse Tyson, and was a really interesting show about a topic that I’m really interested in (dark matter and dark energy), but being as tired as I was, sitting in a comfy leaned-back chair in a dark room was too much and I slept through most of it. I have to say I enjoyed my nap, but was disappointed to have missed the movie. Not long after the show, Gail and I decided we were done for the day. It was after 4:00 and the museum closes at 5:00 so it’s not like we bailed out way early, but we were just too tired to continue walking much more. We took the Metro back to the hotel and just rested for an hour or so – played some cards, read a little, and Gail might have had a short nap. Once we were up to walking again, we went to a place called Pancho Villa for dinner, a Mexican restaurant right next door to the hotel. The food was great and it wasn’t crazy expensive. We all enjoyed our dinners and the fried ice cream after wasn’t bad either. After dinner, we watched some TV before going to sleep. I didn’t bring an actual pedometer on this trip, but my phone has an app called S Health which does the same thing. At bedtime, I checked and it had counted 23,187 steps, equating to 21.82 km, on this day alone. Not surprisingly, we slept a little later on this day than the others. We stopped at Panera Bread for breakfast again and ate on the train into the city. Today our destination was the International Spy Museum, just a couple of blocks away from the Mall. This is a non-Smithsonian museum, which means we had to actually pay money to go in but we had a lot of fun so it was worth it. In addition to the museum itself, there were two extra activities: Operation Spy and Spy in the City. The first was an “escape room” sort of thing where the participants had to act together as spies to solve problems and save the world. Gail and I hung out in the gift shop while the boys did that, and they had a great time. Once they were done, we started Spy in the City. This was a sort of geocaching-like scavenger hunt where, again, we had to save the world. We got two Android tablets which contained videos describing our missions, and had to follow clues that took us to various places in the area. This took us about an hour and a half, and we had a lot of fun on this adventure as well. Next, onto the museum itself. We originally figured we’d be there for an hour or two, but ended up staying until dinner time. There was a lot to see, with information and artefacts about spying from ancient times (China, Greece), through the Civil War, World Wars I and II, and into the Cold War era. Oddly, there was very little recent stuff; for example, there were descriptions of human-hair-sized cameras, but they didn’t have any. There was barely a mention of technology after about 1980 until the very end where they had one room talking about safeguarding the power grid and Internet from terrorists. There was also a large James Bond exhibit with artefacts, pictures, and videos from various movies. By the time we were done at the Spy Museum, it was dinner time. We stopped at the Shake Shack right next door to the museum. The burgers were very good and though Nicky was the only one who ordered a shake, we all helped him finish it and it was great as well. Once we were done there, the museums were all closed and we were still pretty tired from yesterday so we headed back to the hotel. Played some cards, watched some TV, the usual bedtime stuff. We also packed up for the trip home tomorrow. Gail had to be home for a Scouting meeting at 7:00, so we got up around 7:30, checked out, and left. Breakfast was at a Dunkin’ Donuts in Hagerstown, just down the street from the hotel where we had stayed on Tuesday night. Lunch was at a place called Sarina’s in Phillipsburg, PA. I don’t know why you’d ever need to go to Phillipsburg, PA, but if you do, stop in here for some great food. I had a steak sandwich which was excellent, Ryan loved his pasta, and I don’t remember what Gail or Nicky had but they enjoyed them. In particular, the buns were amazing and we picked up some to go. After a 15 minute stop at the Peace Bridge, we got home around 7:00. It really shouldn’t have been an 11+ hour drive – there weren’t any major delays but we were taking our time. Maybe a little too much. Gail was a few minutes late for her meeting. This entry was posted in Vacations on September 7, 2016 by Graeme. The summer of 2016 continues and here is another vacation report, the second of three. Last month we went camping at Darien Lake in New York. This time we went north, then north again, then way north, and then took a train to go even further north. 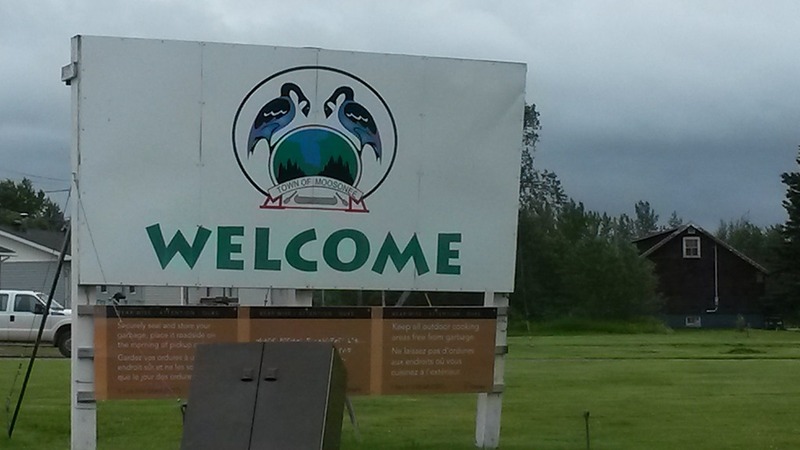 The destination was the tiny towns of Moosonee and Moose Factory, on the Moose River about 19km southwest of James Bay. In Ontario, this is way the hell up north but in terms of latitude, it’s about the same as Edmonton or London, England. We don’t know anyone who lives in either of these towns so it was not a trip to visit family, and it’s not a big tourist spot but it’s a place we’d never been and a long train trip through the north sounded fun. Also the thought of seeing polar bears and the Northern Lights was a big draw but that ended up being quite different from what we were hoping. I did not set the trip odometer on the van before we left (and we didn’t drive the whole way anyway) so I don’t know how far we actually travelled, but Moosonee is 885 km from Waterdown as the crow flies, essentially dead north. Google Maps says the drive from home to my parents’ place in Baysville to the motel in Cochrane is 784 km, and the train trip from Cochrane to Moosonee is about 300 km, so we travelled almost 1100km one way – about the same distance from our house as Nashville, TN. And we didn’t even leave Ontario – I don’t imagine there are a lot of states in the US (or entire countries in Europe) where you could travel 1100 km in a straight line and not leave the state/country. The vacation started on Saturday, July 30, 2016 – my 47th birthday. We drove up to Baysville to stay with my parents for a few days. My sister and her four-year-old daughter Liv were there as well so it was a nice long family weekend. I won’t go into great detail about that part of the trip, but there was some beach time, lots of reading and card games, computer upgrades (I do that a lot at my parents / in-laws’ places…), afternoon naps, and we even went to see Jason Bourne at a theatre in Bracebridge. It was a relaxing four days at the cottage, and then our northern adventure began. We left the cottage first thing Wednesday morning. By “first thing” I mean 8:30 or so but considering Gail was sleeping until 10:30-11:00 each of the previous few days, this was pretty early. We arrived in Sundridge (chez Matthews) around 9:45 to pick up Gail’s stepmother Jackie and our niece Alison, who accompanied us on the trip. After a brief stop we continued north, stopping for tea in North Bay and lunch at a truck stop called Gilli’s in New Liskeard. We arrived at the ThriftLodge in Cochrane around 4:30. Gail and the boys and I were in one room while Jackie and Alison were next door. We knew this wasn’t going to be the Ritz-Carlton and it wasn’t but it was a decent place for the price. The beds were fine, there was a TV and fridge in the room, and free wi-fi. We needed a few extra towels and that was no problem. The biggest problem was the heat – it was 31° when we arrived and didn’t get much cooler overnight, which was a problem because the A/C unit was kind of junky. It chugged away all night but didn’t really reduce the temperature very much. One thing that we thought was amusing was the decor – one of the walls was painted with the lower half purple and the upper half beige, but there was an easily-visible pencil line where the two colours met and the painting at the pencil line was not clean at all. It looked like it wasn’t quite finished. There was also a chain-lock on the door which was broken. 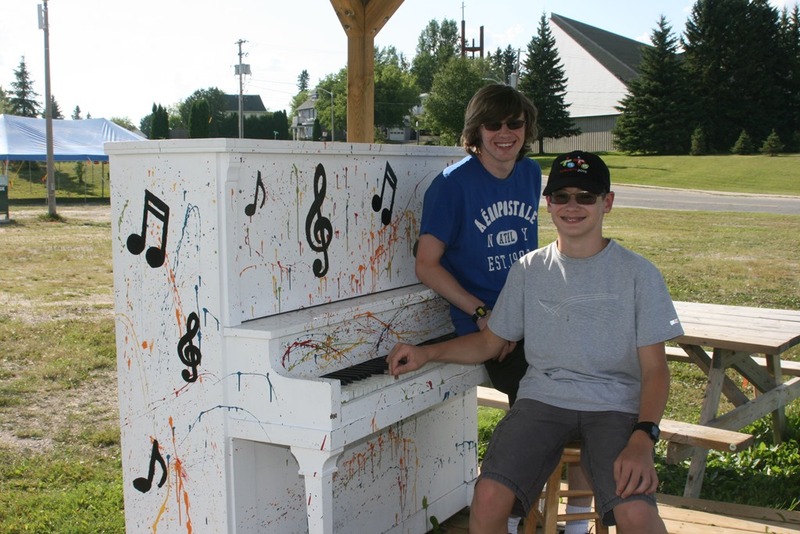 Right: The park in Cochrane had two or three pianos scattered around for people to play whenever they feel like it. Neat idea. After checking in, we drove into town and went to the park next to the lake (Commando Lake). Jackie grew up in northern Ontario, mostly Timmins, but she spent her grade ten year in Cochrane so she pointed out where things used to be, most of which were no longer there. We walked around and over the lake (there’s a bridge across the middle) and then once people started to get hungry, we decided on Subway for dinner. We picked up our sandwiches and went back to the hotel to eat and play Yahtzee. I don’t actually remember who won the game (I think it was me) but it’s important that you all know that I was the only one who actually achieved a Yahtzee. We set an alarm and got up at 7:00. After showers and something quick to eat (Jackie brought muffins and we had some granola bars stashed away), we packed our backpacks. Since we were taking the train to Moosonee, we wouldn’t have the van handy so we had to carry everything we’d need. We drove to the train station around 8:00 and found our seats. The train left at 9:00 and our tickets were collected shortly after that. Once they had our tickets, we were free to move around the train. The train seats were comfortable, though most of the armrests between them were broken. You could raise or lower the armrest but if it was raised, the slightest pressure from leaning on it (i.e. attempting to actually use it for its intended purpose) would lower it anyway. Our car was maybe 1/2 to 3/4 full. Our car was in between the dining car (to the back) and the observation car. We first headed to the dining car where we bought breakfast. There quite a wide variety of options available: coffee, tea, bagels, fruit, cereal, and various toasted egg sandwiches. It wasn’t the cheapest breakfast ever but the prices were surprisingly reasonable. When you’re selling to people trapped on a train for five hours with no other food options, you could easily charge $4 for a coffee and $10 for an egg sandwich but the prices weren’t bad. After breakfast, we spent most of the trip in the observation car playing cards. I think Jackie, Alison, and Gail each had naps. 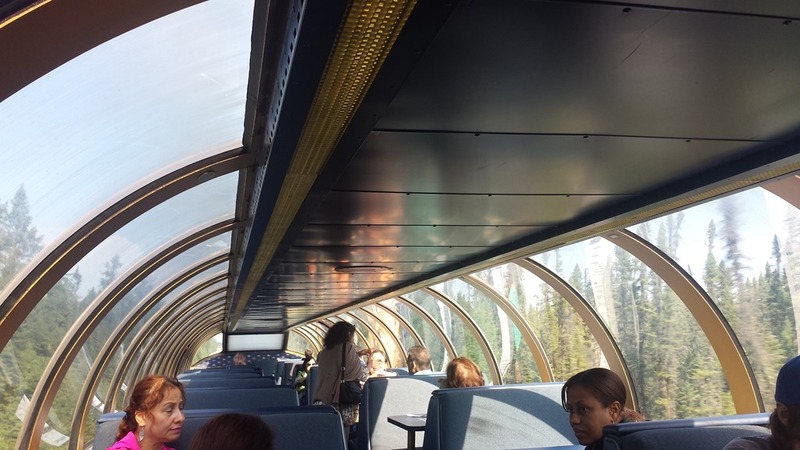 The scenery from the train was basically the same the whole trip – thousands and thousands of black spruce trees. But this was not a vast field of Christmas trees; the majority were tall and narrow and scrubby-looking. Some looked like 50-foot poles with branches only on the top 10 feet. For part of the trip, there were power lines parallel to the tracks. 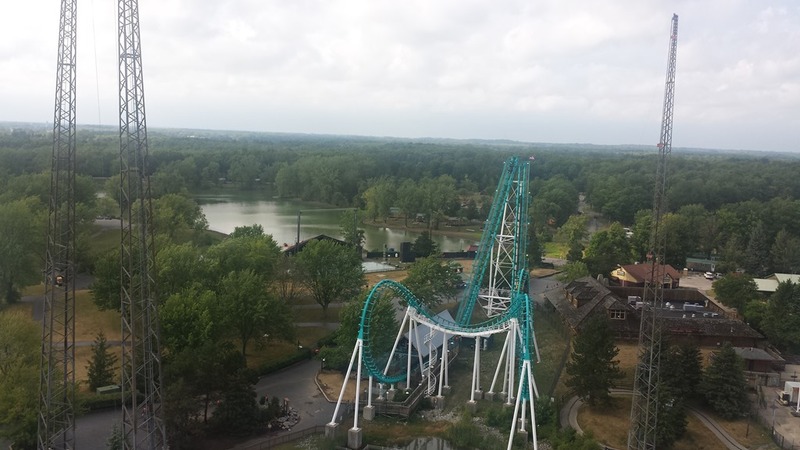 To build the towers, there was a strip about 50 feet wide next to the tracks where all the trees had been removed. Oddly, every few hundred feet there was a rectangular section beyond that strip where the trees had also been removed. This meant that the tree line following the tracks, if viewed from above, would have looked vaguely like a square waveform. We weren’t actively looking for wildlife but we may have seen two birds the entire trip. That’s it. Despite the fact that the train is known as “the Polar Bear Express”, we knew we wouldn’t see polar bears from the train. Bears and moose were also unlikely but we figured we might see something, even if it was just a squirrel in the distance. This lack of wildlife held up the rest of the trip, as we saw a few more birds in Moosonee and Moose Factory, but nothing else. We arrived in Moosonee right on time, around 2:45, and it was surprisingly hot considering how far north we’d travelled. Just like Cochrane the day before, it was 31° and humid when we arrived. 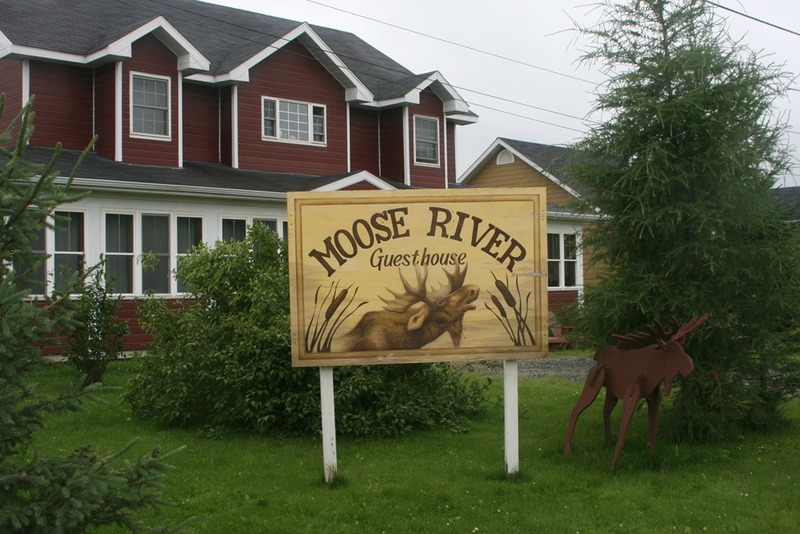 We had booked rooms at a B&B called the Moose River Guest House, which was a five minute walk from the train station. The place was beautiful, quite possibly the nicest B&B we’ve ever stayed at. It had six guest rooms, a common area, dining room, an enclosed outdoor sun room, and a huge kitchen, all of which were at our disposal. It had hardwood floors throughout and was beautifully furnished and decorated. Each room had only one bed, so we had to book three rooms. Ryan and I stayed in one, Gail and Nicky in another, and Jackie and Alison in a third. Jackie & Alison’s room was massive – a queen bed, ensuite bathroom, and a large L-shaped sitting area with a desk, couch, a few chairs including a big recliner, and a bookshelf with lots of books. Our rooms were smaller but still very comfortable. I can’t say enough good things about our stay at this B&B. The manager, Trudy, was very friendly and accommodating, and the fact that there were no other guests at the time meant that we had the whole house to ourselves. Even after we checked out on the Friday, she said we could keep our bags there until we had to leave for the train, and even come back and make use of the house if we had time to kill. After checking in and dropping our bags, we headed out into Moosonee. We had been told there wasn’t an awful lot to see so we figured we’d walk down to the river. We were also told that pretty much everything was on the main street so while walking toward the river, we looked for the main street. It wasn’t until we were almost at the river that I realized we were already on the main street. “Everything is on the main street” was referring to the elementary school (in the same building as the Northern College Moosonee campus), the grocery store, hardware store, LCBO, post office, municipal building, and restaurant. By the time we got to the river, the black flies had gotten so bad that we just turned around. We rarely get black flies at home but the further north you go, the worse they get. In Muskoka, they’re bad in May and June and then that’s it; it’s mostly just mosquitos after that. In Moosonee, the black flies are bad all summer. There’s only one restaurant in town, called the Sky Ranch. We had planned on having dinner there but when we found the place, it looked like a nasty little hole-in-the-wall and we changed our minds. Perhaps the view from the outside was deceiving and the food was outstanding – I’ve certainly been to places like that before. But we weren’t willing to take that chance. Since we had the use of the kitchen at the B&B, we decided to stop at the grocery store and pick up some stuff for dinner. It was a fully-stocked grocery store but our options were still limited because prices were insane. A bag of chips was $5.99. A case of Coke was $17.99. One box of KD – $1.29 at home, $0.99 on sale – was something like $4.29. Pretty much everything was at least double what we’d pay at home. Welcome to the north. We were going to grab a box of wings or chicken fingers or something easy but couldn’t justify the cost. We ended up buying a box of fettucine, a couple of jars of alfredo sauce, and a surprisingly inexpensive premade salad. On our way back, we stopped in at Northern College and looked around at the displays of Native culture. There were paintings and sculptures, but also examples of beading and moccasins, various hunting and trapping implements, and other historical information. It was like a mini-museum with classrooms in between the exhibits. We stayed a little while (not gonna lie, we also enjoyed the air conditioning) and then returned to the B&B for dinner. After dinner we thought about going back out for a walk around town but the torrential rain and gale-force (probably not, but strong) winds make us reconsider. Instead we stayed cozy and dry inside the B&B, playing cards and watching the Jays game until bedtime. …Nicky and I got up and went outside. It had stopped raining so we looked up and immediately were greeted by a very bright street light. Ah, light pollution, we meet again. But it didn’t really matter, since it was far too overcast to see anything. We thought we’d at least get a non-light-polluted look at the Milky Way, but we couldn’t see any stars at all. We were only out for a few minutes before giving up and returning to bed. The rain soon returned and there was lots of thunder overnight. In the morning, we woke to find that Trudy had set out things for breakfast. There were a few types of cereal, some hard-boiled eggs, bagels, bread, oatmeal, milk, juice, and of course coffee and tea. After eating, we packed up our bags and put them in the sun room, then walked down to the docks. Luckily the black flies weren’t nearly as bad on this day as the previous day. We took a water taxi over to Moose Factory Island. The normal price is $15 per person but our taxi driver (since it’s a boat would it be taxi pilot? taxi captain?) gave us a deal: $10 per person and if we book a ride back later, he’ll give us the same price for the return trip. 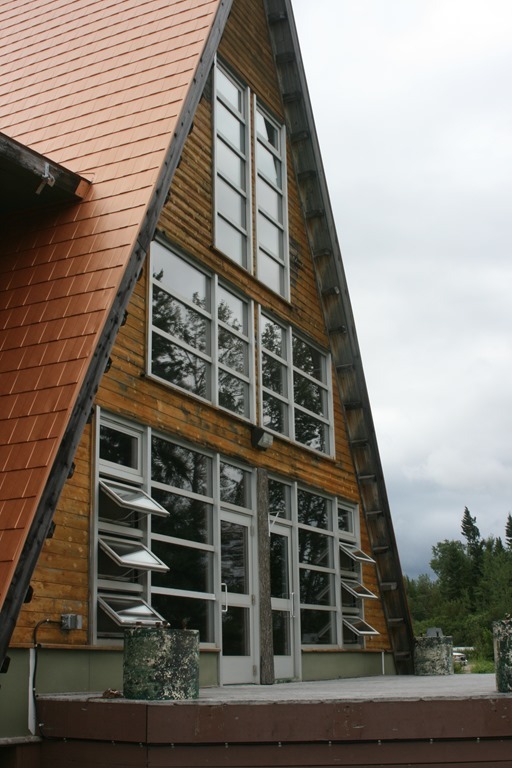 He dropped us off at the Eco Lodge, which is a hotel in suburban Moose Factory. From the web site, somehow I had the impression that the Eco Lodge was more than just a hotel, though I wasn’t sure what. I thought maybe there were exhibits or a small museum or something but no, it was just a hotel. A beautiful-looking hotel, but nothing more. Even the restaurant was closed until dinner time. We walked into town, about 20 minutes, until we arrived at the Thomas Cheechoo Jr. Memorial Complex, located on Jonathan Cheechoo Drive. I believe the street is named for the Jonathan Cheechoo who used to play for the NHL’s San Jose Sharks, and I imagine he’s also related to the building’s namesake. The complex was the site of the final day of a “Gathering Of Our People” (and we did see signs advertising it as GOOP). Both Moosonee and Moose Factory have large native communities; in fact I heard that something like 80% of the population is Cree. As part of the Gathering there was a powwow, but it was the previous day so we missed it. There was a live band playing; I expected it to be traditional Cree music and was interested to hear that, but to my surprise they launched into a bunch of CCR songs. We grabbed some lunch and Gail, Nicky, and Alison tried their hand at archery. We planned on heading down to the Cree Cultural Centre but as we started walking in that direction, the rain returned. We decided to head back to the Eco Lodge and wait for the water taxi, since we were getting wet and we wouldn’t have much time at the Cultural Centre anyway. It only really rained for 10-15 minutes and then it got hot so we were mostly dry by the time we got back to the Lodge. After a short wait, our water taxi arrived and returned us back to the mainland. By this time it was raining again so we took a taxi back to the B&B for guess what? More cards! Around 4:00 we grabbed all of our things and headed to the train station. Being a Friday night, the train was much more full than it had been on the way up. We had dinner on the train, and Jackie, Alison, and the boys spend most of the trip in the dome car again, while Gail and I read / napped. We arrived back in Cochrane around 9:50pm. We drove back to the Thriftlodge and checked in again. The four of us got exactly the same room we had before while Jackie and Alison were a couple of doors down. Remember I said that our room looked not-quite-finished? That’s because it wasn’t. While watching the Jays game before bed, I happened to look at the wall next to the TV and saw that the pencil line had been covered with wooden trim, and the broken chain lock had been replaced with a gleaming gold bar lock. The room looked much better – clearly they were busy while we were gone. In the morning, we packed up, checked out, and headed to Tim Horton’s for breakfast. 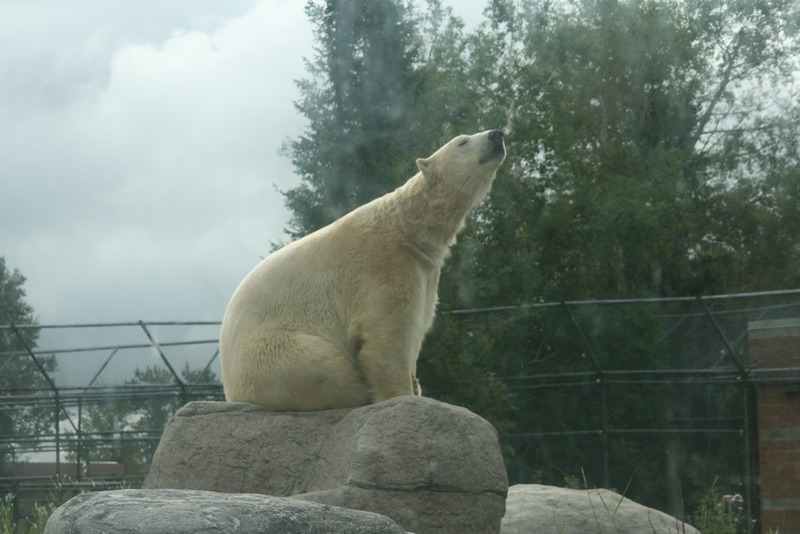 After we ate, we drove over to Cochrane’s main tourist attraction, the Polar Bear Habitat. I was a little worried that it was going to be a crappy little zoo with an old and mistreated polar bear, or maybe two, but this couldn’t have been further from the truth. It was a lovely place and while it’s true that there were only two polar bears, they were anything but mistreated. The Habitat is not just a place where the public can see polar bears, it’s a place where scientists study and care for polar bears – in fact it’s the only place dedicated to polar bears in the world. We arrived just in time for the “meet the keeper” talk, where a scientist told us all about the facility and the bears. She was clearly Australian, and I thought it was odd that an Australian would want to study polar bears since Australia is about as far from where polar bears live as you can get. She told us that she was studying brown and grizzly bears in BC when this job came up and she couldn’t turn it down. Anyway, she was full of great information and very accommodating. She must have spent an hour talking to all of the visitors. The two massive bears were both wandering around their enclosures and one even went for a swim. I was amazed at the overall size of the bears but in particular, their paws were enormous. Outside, there was a “heritage” village, recreations of a number of old buildings from the area. One was a railroad station with lots of train memorabilia, including a video of the history of Cochrane and its fires – the town has burned entirely to the ground twice. But they learned: the second time they rebuilt the town, the first thing they built was the fire station. Here’s a video of Henry the polar bear trying to get into his room. The doors were closed because they were cleaning it, so he couldn’t get in. But he kept checking and every time he found the doors closed, he swung his head around in this hilarious frustrated-looking manner, as if he were saying “my GOD, it’s STILL closed!” We must have watched him do this 20 times. The Polar Bear Habitat was a great place and a fun way to spend a few hours. After perusing the gift shop, we got in the van and headed south to Sundridge, stopping for lunch at Rolly’s Restaurant near New Liskeard. We also stopped a few times to take pictures of the big statues of things we saw on the way up – a buffalo, a lumberjack, a pickerel, a cow, and in Cochrane, a polar bear. We spent the night in Sundridge and drove home the next day, thus ending the second of our three mini-vacations this summer. All in all, I have to say this wasn’t our most exciting vacation ever. Moosonee and Moose Factory are not really tourist towns and there wasn’t really a lot to see. There were no moose and no polar bears (except where we expected them to be but no wild polar bears) – we didn’t even see any squirrels. No northern lights and no view of the Milky Way. And there were bugs and a lot of rain. But we had fun anyway. We spent a lot of time playing cards and reading, and I suppose we could do that at home. But we also got to visit an area of the country that we’d never been to before, stayed in a lovely little B&B, experienced a bit of Native culture, and met a lot of friendly people. We also took a trip on a train (that wasn’t a GO train) which is something we haven’t done since France in 2008. I’m not sure I’ll go back, but I’m glad we went. This entry was posted in Vacations on August 21, 2016 by Graeme. My blog was once a place where I’d post my thoughts on many things. From my family to sports to music to movies and the occasional rant, I was posting 15-20 articles a month at one point. That’s dwindled down to a handful of postings a year, though my lacrosse blog is much more active during lacrosse season. But one thing I still do is vacation reports. These are primarily for us so that we remember some more details about our vacations, but I’ve been told that others find them entertaining as well, so here’s another. I’ll have at least two more before the summer of ’16 is over, so be on the lookout for those. In this installment, we find our heroes camping at Darien Lake amusement park in New York for a few days. We had been there before but not in many years and we’d never camped there. The campground is right next to the park and we had a pretty good spot so the walk from the park to our site was just a few minutes. Darien Lake is only about a two-hour drive from home and check-in wasn’t until 2:00, so we took our time in the morning and left home around 11:30. The intention was to cross the border, head to the Olive Garden in Niagara Falls NY for lunch (since we don’t have the Olive Garden in Ontario anymore <sad>), hit Wal-Mart for groceries, and then continue to the park. The grocery part was necessary because we can’t bring fruits, vegetables, or meats into the US from Canada. The timing didn’t work out as we wanted so we ended stopping for lunch at McDonalds on the Canadian side of Niagara Falls. After a short border wait, we found Wal-Mart for some shopping. Shopping took longer than expected so we didn’t get to the park until around 4:30pm. We found our site and got the trailer set up, but then decided to head into the park for dinner since it was too hot (around 32°C and humid) to cook. There are several places to eat in the park but only two were air conditioned so that instantly narrowed our choices: a roadhouse-type place called Beaver Brothers Lakeside Café, and an Italian restaurant called Maria’s. We asked the boys what they preferred and Italian was the response. Since we had skipped our Olive Garden trip, we were OK with this idea. We located Maria’s on the map and headed there. But as soon as we saw the building, Gail and I both stopped in our tracks. We both remembered, at the same time, that we had been very disappointed with the food at Maria’s the last time we were there. We turned around and went to Beaver Brothers, which we had also been to before but had no negative memories. The food was pretty good and not crazy expensive, though we were less than thrilled with the service. The waitress was new, which explained some of it, but when you arrive at a restaurant around 5:30 or so and it doesn’t close until 10:00, being told that you can’t have soup because “they’ve put the soup away” is a little weird. I ordered fish (which was excellent) and a Caesar salad but was given a garden salad. It was fine so I didn’t complain. The boys both ordered pasta and were told they could have their choice of soup or salad (but they’d “put the soup away” so just salad) and also their choice of fries, mashed potato or mac & cheese. Then after we ordered they were told that because they got the pasta, they didn’t get the second choice at all, just the salad (on reflection, pasta with a side of fries or potatoes does seem a little weird). Then they never got the salad anyway. The waitress took responsibility and was very apologetic and the manager came by and took Gail’s meal off the bill so it really wasn’t that big of a deal in the end. We walked around the park for a while and the boys did a few rides. We hung out for “Ignite the Night – Colorblast” which is a laser / computer animation / pyrotechnic / firework / music show which we really enjoyed. By the time we returned to the trailer it was quite late so we skipped the campfire and just went to bed. During all this time we had both breakfast and lunch while playing Yahtzee and a number of card games. Gail and I play a lot of rummy while camping and the boys had just learned euchre so there were a few games of each of those. Ryan also taught us a card game called Coup that he learned at school but it was very complicated so we only played it once. Not long after lunch, the rain stopped and we headed into the park. We figured all the rides would be wet so the boys played Pokemon Go on their phones. This is a game which had just been released a month before. It’s a sort of augmented-reality geocaching-type thing where Pokemon are located in various areas (like a geocache) and you have to “catch” them. After a couple of hours of that and a few rides, we went back to the campsite for dinner. But just a few bites into our burgers, the rain started again. It was very sudden – we heard thunder off in the distance but it gradually got louder. Then we heard the rain in the distance just a few seconds before it got to us. We piled into the trailer quickly and a few minutes after that it was torrential again. After it stopped, we went back into the park for some more Pokemon Go, a few rides, and the laser show. Again we skipped the campfire. Instead the four of us played a board game called Sequence before heading to bed. No more rain but we slept in anyway. After breakfast we all had showers and got ready to head to the water park. While I was in the shower, Gail was back at the site and someone from Darien Lake came by with an envelope for us. Inside was a sheet of 2-for-1 coupons and a $50 Darien Lake gift card! We were pleasantly surprised but it turned out that it was part of the WagJag deal that we used to book the vacation. Since we had forgotten about it, it was kind of a free bonus so we headed into the park and used it to buy lunch. After lunch we went to the water park where we confirmed Gail’s main memory of the water park – COLD. We did one lap of the lazy river but couldn’t stay in the water long enough to do a second. The wave pool was slightly warmer but after 10-15 minutes we bolted out of there as well. We did a few water slides and Nicky and I did the “toilet bowl” (they call it the Tornado), and then Nicky did a slide called “Brain Drain”, where you stand in a vertical tube and the floor drops away. Once we were done in the water park, we got dressed and then watched a live musical show called American Rock. Some of the singers had very powerful voices while others didn’t but we enjoyed the show. After that we went back to the campsite for dinner. After dinner it was back to the park again where we used one of our 2-for-1 coupons on the go karts (Ryan won but he did have a faster kart) (yes he did), did a few other rides until the laser show started (which is when the park closes). We didn’t stay for the show this time but listened to it on the walk back to the campsite. Another late morning. We slept until 9:30, then had a quick breakfast before getting packed up. While taking down the dining tent, Nicky was bitten or stung by something, though he never saw what it was. Within minutes he had a red welt a few inches wide on his arm and not long after that he had itchy hives all over his body. He was breathing fine and the hives were not much more than a little irritating so we continued with our packing. There was a camp store not far away so once we were done, we picked up some Benadryl and that cleared up the hives. Something else to add to the packing list so we bring it next time. We pulled the trailer into a special camper section of the parking lot and went into the park for our final day. 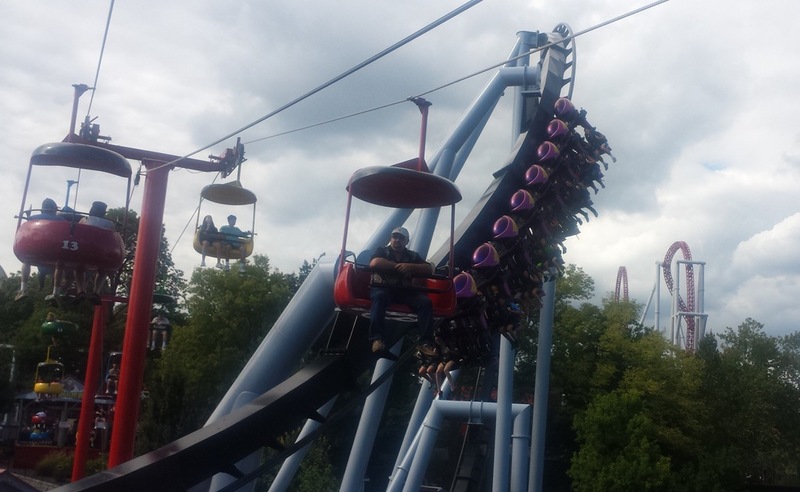 The boys did some rides and Gail accompanied Nick on the Boomerang, a forward-and-backwards coaster that we always refer to as the Bat since that’s what it’s called at Canada’s Wonderland. Actually, Gail and I almost always refer to rides by their Wonderland names. 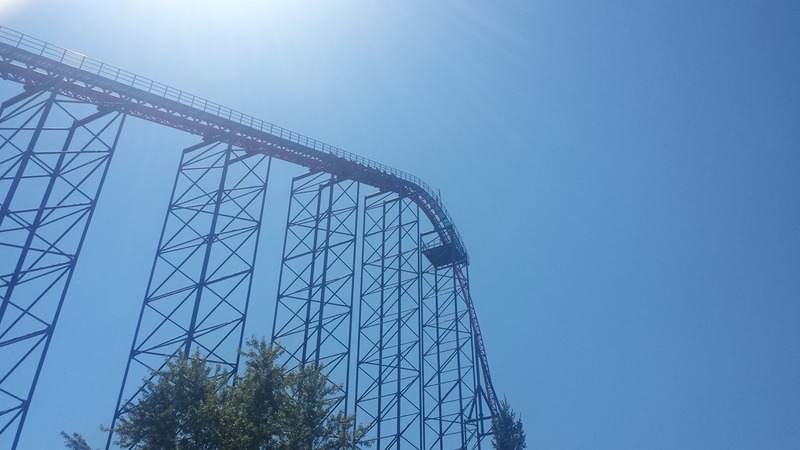 The biggest coaster at Darien Lake is the 200+ foot high Ride of Steel. Nicky wanted to do this one but as per usual, none of the rest of us were up to the challenge (Gail and I did it many years ago but… that was many years ago) so he went by himself. This turned out to be much more stressful for Gail than for Nicky. Here’s a picture of Nicky going up the first hill. He’s near the back with his arm in the air. The second picture is him near the top. We bought a pizza for lunch which was very good and then did some more rides. We even managed to convince Ryan to try the Enterprise Silver Bullet. Nicky finished the day with the final coaster, the Mind Eraser. We left the park around 4:00 and headed back to the Olive Garden in Niagara Falls. This time the timing worked out and we had a lovely dinner. After a short wait at the border, we arrived home around 8:00pm, just in time for me to park the trailer, get changed, and head to my baseball game at 8:30. During the opening of the Ignite the Night show, the announcer said that the show is “live” so people’s whistling, cheering, and clapping would influence the show. We saw it twice and heard it a third time and it was identical each time. The fireworks must have been launched over the campsite since they were much louder there than at the show. 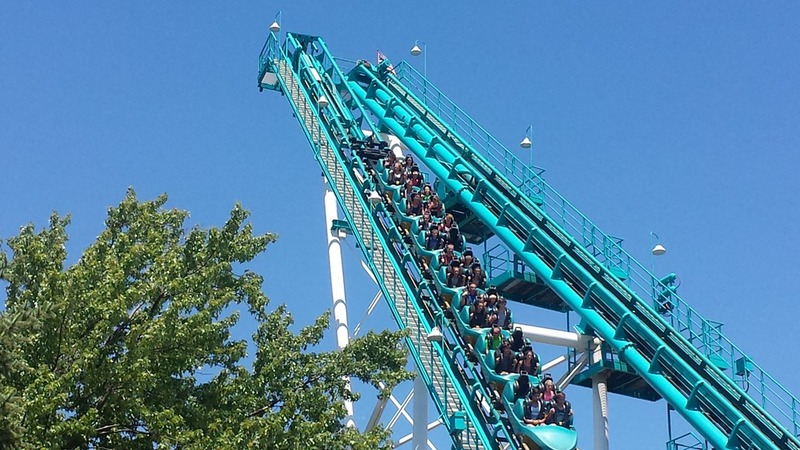 Best rides: for me, Motocoaster. 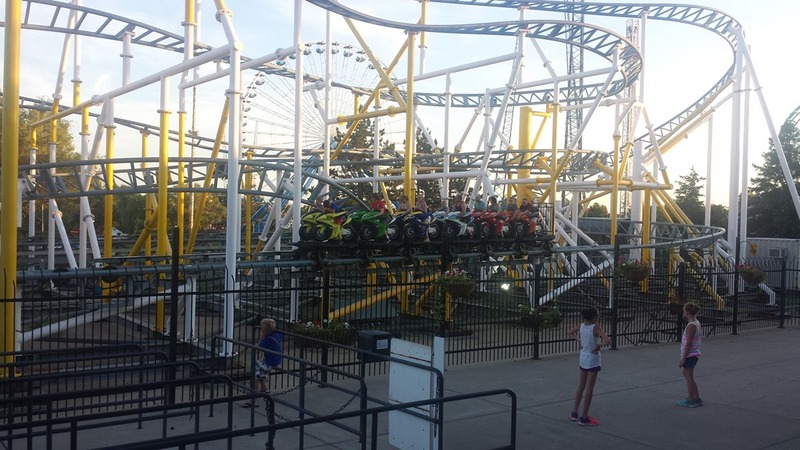 A twisty coaster where you sit on motorcycles (picture above). There’s no chain dragging you up the first hill; you are launched from a stop to top speed in a couple of seconds. Ryan said it was his favourite as well. 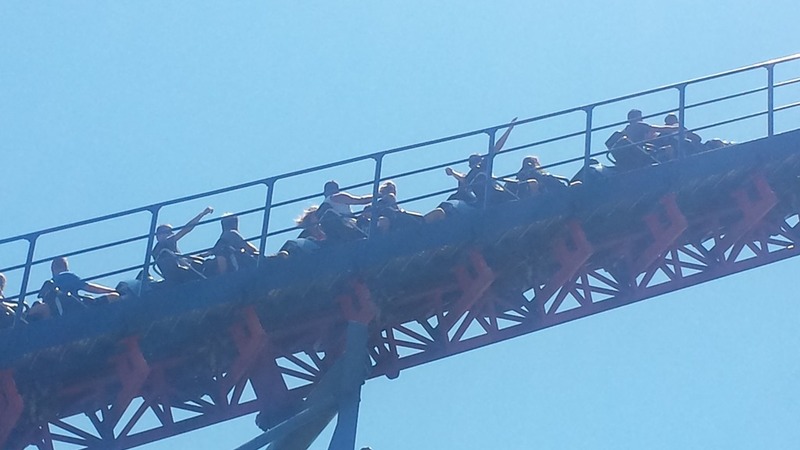 Gail enjoyed the Boomerang, and Nick’s favourite was the Ride of Steel. On many of the rides (and this is true of other parks as well), the ride operator asked people to remain in their seats until the ride “comes to a full and complete stop”. I had to wonder why they needed the stop to be both full and complete. How would the ride come to a full stop that’s not complete, or a complete stop that’s not full? This entry was posted in Vacations on July 29, 2016 by Graeme. In 1986, I went on a school trip of sorts to Elizabethtown, Pennsylvania to compete in a computer programming contest, the details of which I’ve already written about. 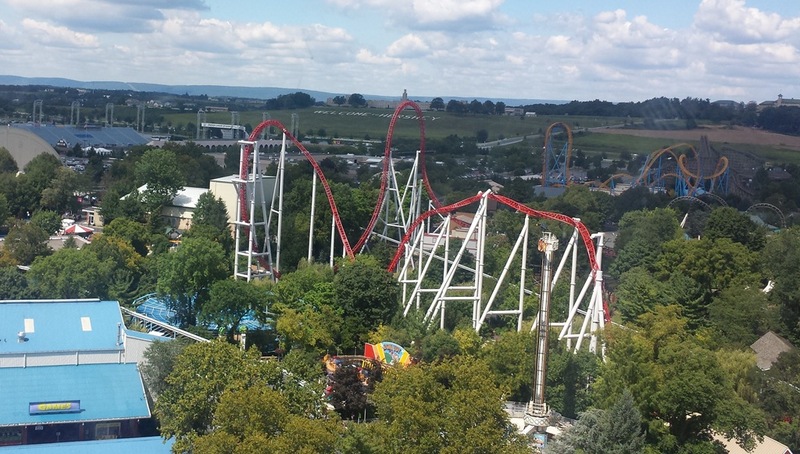 During that trip, we went to the town of Hershey and spent a day at Hersheypark, though I don’t remember any of it. 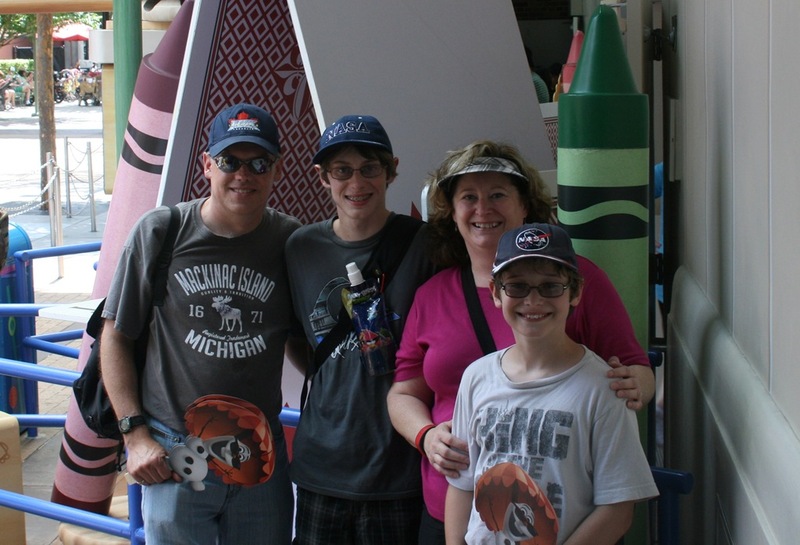 In the summer of 2015, 29 years later, I returned to Hershey with my family (plus one). As I always do, I’ve written up a summary of our trip. The “plus one” I mentioned is my niece Alison (technically “step-niece” I suppose). She and her mom Sandy drove down from their home in Sudbury the same day as we did, and stayed in a hotel nearby. Sandy had to work the whole trip but Alison came with us to the park on the days we went. The trailer was packed from a previous trip and had been sitting in the garage for a couple of weeks. There wasn’t anything we needed to put in the trailer that wasn’t already there, and we couldn’t put anything in the fridge since we can’t bring meats, fruits, or vegetables across the border, so we didn’t even pull it out of the garage beforehand. We packed the van the night before and around 7:30am, we hooked up the trailer and left, stopping at Tim Horton’s for breakfast. An hour later we hit Fort Erie and crossed into Buffalo with no delay at the border. We got onto highway 219 heading south, and stopped near Bradford, Pennsylvania for lunch and gas (insert obvious joke about eating and getting gas here). We continued down 219 to I80 East and at some point, we got onto 322 East which took us right to Hershey. We arrived at the Hershey Camping Resort around 4:00, got checked in, found our site, and started to get set up. This stopped pretty quickly though when the trailer wouldn’t go up. The battery was completely dead. Because we didn’t have to get into the trailer, we didn’t have it plugged in and the battery must have fully discharged. We did have an electrical site so we plugged the trailer in, put up the dining tent, and then went to find dinner. We figured if we left it plugged in for a couple of hours, it would recharge the battery enough that we could put the trailer up. It didn’t. When we got back from the Pizza Hut just around the corner, the battery still had no power. There’s probably a way to put it up without power but according to the manual it requires a particular sized wrench that we didn’t have. Nicky and I went to the front desk and asked if they had booster cables or if they knew of a place where we could buy a battery (and any tools we might need to install it). The guy at the desk called their maintenance guy and he came out with a battery pack with booster cables. This was powerful enough for us to get the trailer up, so we were good to go from there. The trailer was going to be plugged in until Friday so we figured 2½ full days of power should be enough to recharge the battery. After getting set up, we bought our Hersheypark tickets, and since were staying onsite at a Hersheypark resort, our tickets allowed us 3½ hours in the park the day before our first ticket as well as early entry on the other days. We took the shuttle bus from the campground to the park. This was a kind of a recon visit – just getting our bearings in the park and checking out where we wanted to go the next two days. We did do one ride: Reese’s Xtreme Cup Challenge, which is a shooting ride in the same vein as the Buzz Lightyear / Toy Story rides at Disney World. This was a lot of fun and we would end up riding this one numerous times over the next couple of days. After a couple of hours in the park, we took the shuttle back to the campground and bed. We woke up early, had a quick breakfast, and were on the shuttle bus by 8:30 to take full advantage of our early entry. We got in at 9am instead of 10, though only part of the park was open, the rest was blocked. We figured we’d do an hour of rides before meeting Alison (who did not have early entry) at 10. We rode the Comet, a wooden coaster that Nicky loved, Gail and I liked, and Ryan didn’t like at all. Ryan’s just not a roller coaster kid, and neither Gail nor I can handle the big coasters like we used to. Nicky loves them though – the bigger the better. Just as we finished that, we got a text from Alison saying that she had managed to get into the park before opening. We never did figure out how, but that was good. We did the Reese Xtreme Cup Challenge again, then lined up to get to the rest of the park at 10am. We didn’t even know what to head for once the rope dropped, but someone else said that Laff Trak is the newest coaster and that’s where everyone will be headed. We headed there too and waited about a half hour, which turned out to be a good idea since the line for that ride never dropped under an hour for the next two days. This was an awesome ride. It’s an indoor roller coaster but the trick is that each car has four seats – two facing forwards and two facing backwards. The car occasionally spins around so you end up going down some hills forwards and others backwards. Very fast, very exciting, and we all loved it – even Ryan. Alison, it turns out, is even less of a roller coaster kid (I’m misusing the word “kid” here – Alison is 19) than Ryan and she didn’t like it at all. That said, she did ride it again the next morning and didn’t mind it so much. We did various rides the rest of the day which I won’t try to list. Nicky did a couple of coasters by himself since nobody else wanted to do them. Ryan and Alison may not like coasters much, but if it spins, they were riding it. Gail and I mostly watched, though we each rode a couple of things. Lunch was at a sandwich place near Kissing Tower Hill. After lunch we went over to Zoo America, which is included in the ticket price. It’s not a big zoo, but they had some cool exhibits including a desert area complete with burrowing owls, road runners, and big tortoises; a dark area with bats, spiders, a “swift fox” and an ocelot; prairie dogs; elk; bears; huge bald eagles; and a beautiful bobcat. 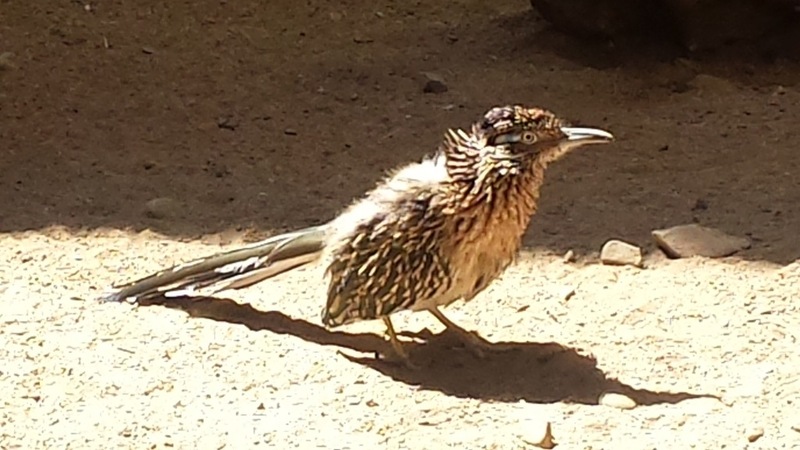 I love zoos, as do my kids, and we all enjoyed this one. After the zoo we returned to the park for more rides until dinner time. We returned to the camping resort where Sandy met us with a couple of pizzas from a local place. After dinner, we went back to the park for some more rides, and returned back to the campsite, thoroughly exhausted, by 10:00. Thursday started off like Wednesday: up early, quick breakfast, on the shuttle around 8:30, in the park at 9, a couple of rides, wait in line for the rope drop, high-tail it over to Laff Trak, wait half an hour, then ride and laugh for a minute and a half. Things diverged from there though, as day 2 was a water park day. Nicky decided to forego the water park for a while in favour of more coasters (since he had to ride them by himself anyway), and Gail stayed in the park with him while Ryan, Alison, and I got changed and headed to the water park. They both tried the Waverider, which is basically a surfing simulation. I took some video of them, though I started watching Ryan rather than watching the camera so I shot 10 seconds of the ground: the first is Ryan and then Alison. Ryan never got the hang of it and got thrown over the top a couple of times. Alison also fell twice and I thought she was done so I stopped filming. They let her try again and the second video is of Alison totally nailing it. There were six water slides though I only did four of them. I love water slides, and these were very fun though the water was pretty chilly. It wasn’t exactly perfect water park weather, actually, since it was in the mid-20’s (low 80’s F) and overcast. At lunch time, we found Gail and Nick and went to Nathan’s where Gail and I had excellent Philly cheesesteaks and fries, Ryan had a burger, Nicky had a couple of corn dogs, and Alison had chili fries. After lunch, Gail headed back into the park to see a dance show and the rest of us hit the wave pool (frigid!) and lazy river. After that, Ryan and I were done but Nicky and Alison wanted to do more slides so they went back to the slide area while we got dressed. After some sliding, they came back so Nicky could give the Waverider a try, and he also nailed it. If you watch the video, you can hear the operator telling me he could have a career in surfing. He and Alison then got dressed and we did a couple more rides before meeting Sandy in town at Fenicci’s of Hershey where we had an excellent Italian meal. Thursday ended like Wednesday did: back to the park after dinner, more rides, back to the campsite around 10. Friday morning we slept in a little before packing up. Our assumption from Tuesday turned out to be incorrect – the trailer battery was still completely dead. We got a boost from the maintenance guy again, then parked the trailer in the overflow lot (big thanks to the Hersheypark Camping Resort people for being so accommodating!) and took the shuttle back over to Hershey’s Chocolate World, which is right next to Hersheypark. There’s a huge store where you can buy all kinds of Hershey and Reese stuff like shirts, hoodies, hats, toys, and collectables of every kind as well as TONS of chocolate. A number of flavours of Hershey’s Kisses are for sale there that you can’t find anywhere else (pumpkin spice, candy corn, macadamia nut) as well as five pound Hershey bars and half-pound Reese’s peanut butter cups. There’s also a “make your own candy bar” thing that was expensive (so we skipped it) and a free tour of a reproduction of the factory. After coming off of the tour, a lady stopped us (me and the boys) and asked if we wanted to participate in a survey about non-chocolate candy. We said sure so she brought us into a room with a bunch of cubicles with iPads. We answered a few questions and ate a soda cracker (to “cleanse our palates”), then she gave us some candy which were similar to Rockets or Sweetarts and we answered some more questions about them. This took no more than a couple of minutes, and we each got a Hershey bar on the way out as a gift! Our next adventure was a very entertaining and fun trolley tour of the town of Hershey. There were two tour guides – the funny guy and the straight man (or woman in this case). The funny guy kept getting off the bus and then coming back on later dressed as a character from history and tell us about life at whatever time he was supposed to be from. Then he’d get off, we’d continue the tour, and he’d come back dressed as someone else. He was pretty funny and the other guide was smokin’ hot very informative and there was free chocolate so it was a win all around. Except for the people behind us – a group of idiots at the back of the bus were loudly yammering away the entire trip and so nobody in the back half of the bus could hear what the tour guides were saying. At least two people politely asked them to be quiet but it had no effect. The rudeness of some people never ceases to amaze me. Sandy & Alison had stricter time constraints than we did (not to mention their drive was 4½ hours longer than ours) so they headed home right after the tour. We went back inside to do the 4D movie and some more shopping. The movie was fun; the narrator was an animated talking chocolate bar but there must have been a guy in a motion capture suit behind the scenes, since the chocolate bar responded in real time to the audience. This was very cool. Once we finished there, we took the shuttle back to the campground where we picked up the van and drove into town to The Hershey Story, which was a museum dedicated to the town and company founder, Milton Hershey. Ol’ Milt was was quite the impressive man. He started four different businesses, each of which failed and left him bankrupt before he finally got successful not with chocolate, but with caramels. Once he realized that his biggest customers were buying his caramels and coating them in chocolate, he sold the caramel business and started a chocolate company. Then once he was hugely rich, he left his entire fortune (about $60 million in 1918) to the private school for underprivileged kids that he and his wife (Catherine, who he called “Kit Kat” and named a chocolate bar after) founded. The school is still running, educating over 2,000 kids from across the US for free, and the trust he created for the school still owns the entire Hershey corporation and is now worth billions. After sampling some chocolate from around the world (Mexico – yuck, Venezuela – YUM), we went back to the campground to pick up the trailer, then got gas and hit the road. We drove north and east to Shamoken Dam PA, about an hour away. We checked into the Hampton Inn, and walked across the street to a place called Red Robin for dinner. We’d heard of this chain but knew nothing about it and damn, were we impressed. Gail, Nicky, and I all had burgers that were outstanding, with great fries as well, and Ryan loved his fish & chips. Dinner was so good that I tweeted to Red Robin, asking them to please open restaurants in Canada. They replied that they had some, but they’re only in BC and Alberta. Ontario please! We love our trailer, and the beds are quite comfortable (and an order of magnitude nicer than sleeping on the ground), but man were the Hampton Inn beds nice that night. After breakfast at the hotel, we tried to leave for home. We really did. But the van must have seen what fun we had with the dead trailer battery that it decided to have a go. No engine start, no lights, it wouldn’t even unlock the doors. Completely dead. For the third time in five days, we needed a jump start. The hotel manager gave us a hand and once we got the van started, we drove north on route 15 all the way to the Corning Museum of Glass in Corning, NY. This may not sound like the most exciting place ever, but we were really impressed. There were a number of demonstrations and shows including glass blowing (the guy turned a blob of glass into a beautiful vase in 15 minutes right in front of us), flameworking (a different guy turned a couple of glass rods half an inch wide into a goblet in 15 minutes right in front of us), glass breaking (more about the differences between standard, bulletproof, and tempered glass and how heat and pressure affects them), and fiber optics. There was a lot to see and we didn’t see it all so we may have to go back there again. After the museum we drove north to Bath, NY where we stopped at a Ponderosa. This was kind of a nostalgia thing for me and Gail since we both remember going to Ponderosa as kids but they haven’t been in Canada for 30+ years. For a buffet, it was pretty inexpensive but there wasn’t a ton of variety. After dinner we continued north and west through Batavia and Buffalo to Niagara Falls, crossed at the Peace Bridge after a 15-minute wait at the border, then arrived home around 10pm. The roads in New York on the way down were terrible. Bumpy with potholes everywhere. The second we crossed the border into Pennsylvania, things were much better. On the way back, we expected to hit the opposite once we crossed back into New York, but those roads had been freshly paved and were great. I guess they hadn’t gotten to route 219 yet. When getting on the highway in Pennsylvania, you have to be quick because the merge lanes are about 6 inches long. This is especially fun when you’re pulling a trailer. I don’t know how truck drivers do it. We camped for 3 nights and other than breakfasts, we made no meals at the campground. I thought that visiting Hersheypark might trigger some memories from my 1986 visit, but it didn’t. The closest thing was the Sooper Dooper Looper roller coaster. I don’t remember if we went on it, but I had a very slight memory of the name. On the way to Corning, we drove through a town called Williamsport, where traffic slowed down considerably. It turns out that the Little League World Series takes place here every year, in late August. There were two games on the day we were driving through, including the International Finals, and we were just in time to be in line with all the spectators. The traffic added a good half hour to our drive. We stopped at a Wal-Mart to get Cherry Coke Zero which we can’t get in Canada, but they had none. We did pick up a case of Cherry Diet Pepsi, but it isn’t as cherry-y as the Coke. Going shopping in the US is always fun because they have exciting and delicious things we don’t have in Canada, like pork rinds and aerosol cheese! OK, bad examples. The weather was awesome the whole trip. Mid-high 20’s (low 80’s) the whole time, no rain. A touch warmer on the water park day would have been good, but even that was fine. After trickle-charging the trailer battery overnight, it’s fully charged now. Thought you’d want to know. This entry was posted in Vacations on September 3, 2015 by Graeme. 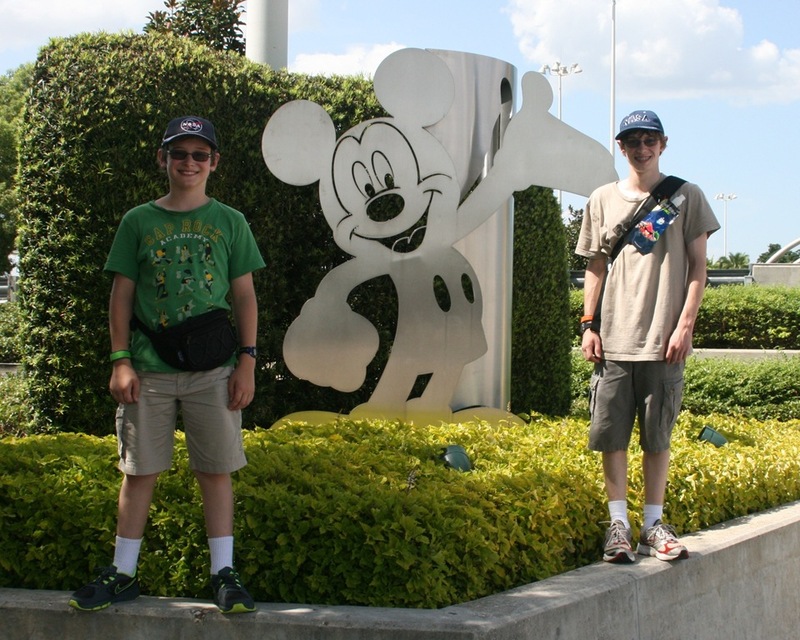 In August 2014, we spent two weeks on vacation in Florida, which included 4 days at the Universal Studios theme parks and 8 days at Disney World. I’ve summarized our vacation in some detail already (planning, Universal, Disney), but here I’m going to look at the similarities and differences between Universal and Disney. I’m skipping the rides, shows, and food, mainly because they’re so varied and you can find ride reviews anywhere. I wanted to focus on other parts of the experience that may not get talked about as much. Primarily, I want to look at the difference between their two “line-skipping” technologies, Disney’s Fastpass+ and Universal Express. First I’ll describe each one, and then compare them. Disney’s Fastpass has been around for a while (it was there when we went in 2002), and it recently got changed and renamed to Fastpass+. It allows you to sign up for a ride hours or days in advance and then skip the line. It’s basically a “reservation” for a ride; you are assigned a time range (usually 15 minutes) and as long as you arrive within that time range, you can go into the Fastpass+ line rather than the regular line, and your wait is significantly decreased. For some rides, this is the only way to get on the ride without waiting an hour or more. You can also get Fastpasses for non-ride things like shows, character greetings, and even some restaurants. However not every ride accepts Fastpasses, and for those that do the number they have is limited so you generally have to get them in advance. You can only have one FastPass+ per ride at a time, so you can’t get a bunch of Fastpasses for Mission: Space and ride it all day. You can get Fastpasses online or through the Disney app, and there are even stations throughout the parks where you can get them. Fastpass+ is free for all Disney guests. Universal Express is similar to Fastpass+ but not quite the same. While Fastpass+ is essentially a reservation system, Universal Express is simply a way of paying extra for the privilege of bypassing the normal lines to wait in much shorter lines. It’s not available on every ride, but almost all of the rides that didn’t offer it were the ones where the lines were short anyway. The big exceptions were the Hogwarts Express and Escape from Gringotts. If you are a guest at one of the Universal hotels, you get Express for “free” (considering the price of tickets and hotels, it’s hard to use the word “free”. Let’s say it doesn’t cost any extra). But if you’re staying off-site, it’s rather expensive. The Express costs anywhere from $34.99 (with restrictions) up to $149.99 (with none, peak time), and that’s per day per ticket. Express is an add-on, so this cost is on top of your regular ticket price. There are two big advantages to Fastpass+. The first is that you know when you will be riding certain rides, and you can plan your day around that. This is also the big disadvantage – if you decide to change your plans, you either lose your Fastpass or you can try to change it online. But we found that changing it was generally not possible because the times booked up very quickly. You can also only have one Fastpass for a ride at a time, so if you loved a ride, you can’t just turn around and bypass the line again. You can do that with Universal Express. 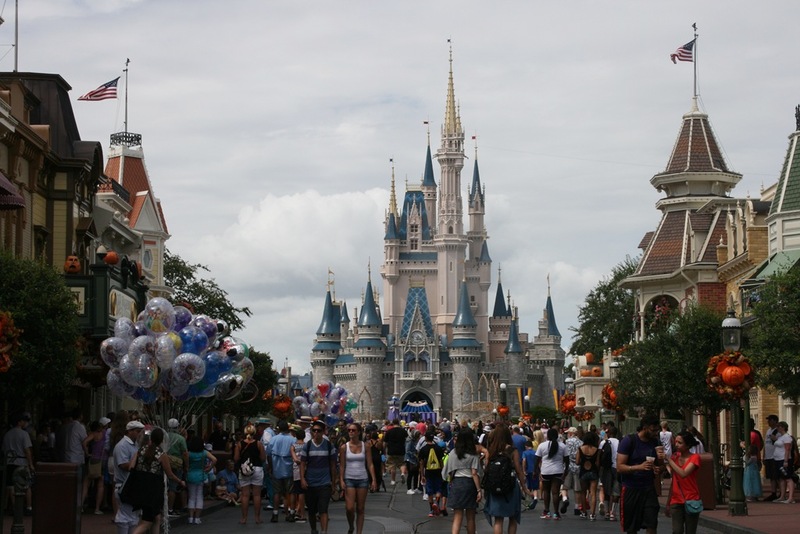 The second big advantage is that Fastpass+ doesn’t cost any extra and everyone can use it. For those staying onsite, Universal Express is included but otherwise, it ranges from a bit of a pricey add-on to “holy crap, are you kidding?” expensive. There were stations around Universal advertising “Buy your Express pass here!”, and when we were there the cost was around $89.99 (per day per ticket). Since we went to Universal for four days, that would have cost us over $1400. That’s insane. 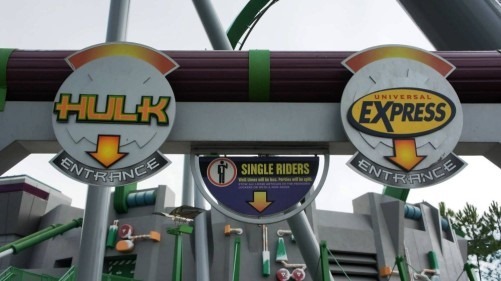 The biggest advantages for Universal Express is that it’s available on the majority of rides and it’s very flexible – you just walk onto the ride. You don’t need to plan ahead and you don’t need an app on your phone. If you get the cheaper version you can’t use it more than once for the same ride in a day, but the “Universal unlimited” pass (that we had) allows you to use it as many times as you want. Since we did stay on-site, the price wasn’t an issue for us and so overall I preferred Universal Express to Fastpass+. it was so much easier to simply walk in the Express line rather than booking the time in advance. Having said that, if I had to pay several hundred bucks per day for the four of us to get the Express tickets, that opinion would change very quickly. In a nutshell, Universal Express was easier and more flexible than Fastpass+, but unless you’re staying on-site, it’s not worth the crazy amount of money. I originally thought the price was unrealistically high – who’s going to pay that? Why would Universal charge that much? But I figured out why. Having this feature free for hotel guests may push people to stay at a Universal hotel rather than off-site. The hotel may be a little more expensive, but if you save $1000+ by not having to buy Express for everyone in your family, you may decide that the higher hotel price is worth it. If I were going back to Universal again, I’d certainly consider it. At Universal, your ticket is a small card (like a credit card) with your name on it and a mag stripe, which you swipe to get into the park and hotel room. Universal Express was a different ticket (WHY?! ), and we bought lanyards to keep both tickets easily reachable. For the cost of the vacation, I think Universal could have thrown in four lanyards. 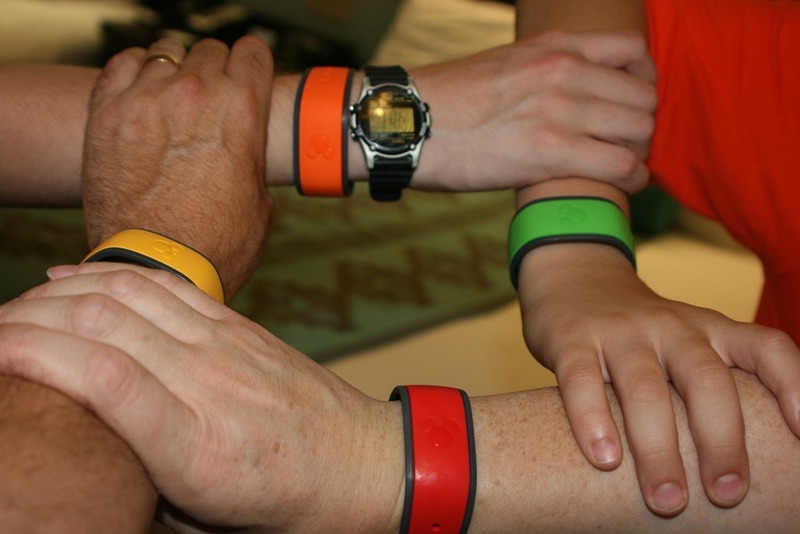 Disney used a “magic band” (see right), which is a plastic bracelet with an RFID chip in it. 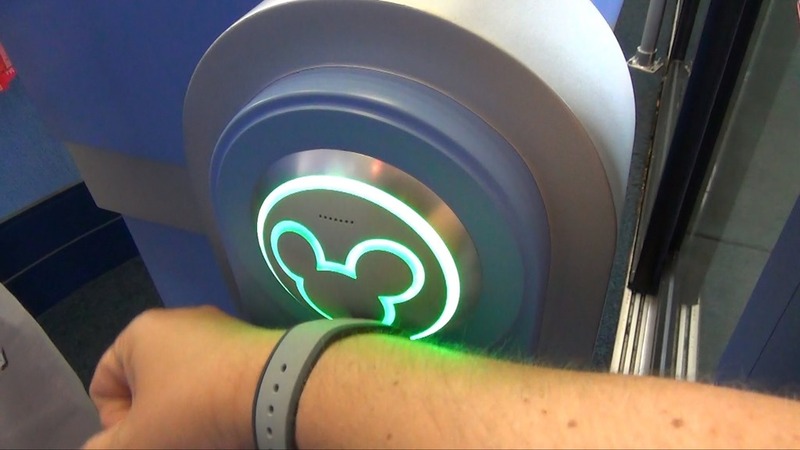 The bracelet was your park ticket (with a fingerprint), Fastpass+ ticket, meal plan ticket, hotel key, and identification for the Disney photographers. You could even use it to charge things to your room (with a PIN). As I said in an earlier article, the only thing it didn’t work for was the in-room safe (which used a large metal key – WHY?!). Advantage: Disney. At a number of rides, there were lockers nearby since they don’t want you bringing cameras and backpacks and such on the rides. At Universal (and at Kennedy Space Center too), there were fingerprint scanners near each bank of lockers. You scanned your finger and it would open an empty locker for you to use. When you came back later, you scanned your finger again and it opened the locker. If you were gone less than 20 minutes or so (the time varied with the general lineup length for the ride), the locker rental was free, otherwise you had to pay to get your stuff back. The boys thought that using the fingerprint scanner was pretty cool, though personally I wasn’t as impressed – I wrote fingerprint scanning software two decades ago. Disney had no such lockers. Advantage: Universal. Both resorts had free wifi throughout the parks and hotels but Universal’s was much spottier. In the hotel, you had to agree to some terms and conditions before it would let you surf, and I had to agree to those terms and conditions a number of times because it seemed to forget. There were a number of places throughout Universal where the wifi signal dropped to nothing. At Disney, the wifi covered just about everywhere (you might say it was universal) and had a much stronger signal. Advantage: Disney. One other difference was the staff. 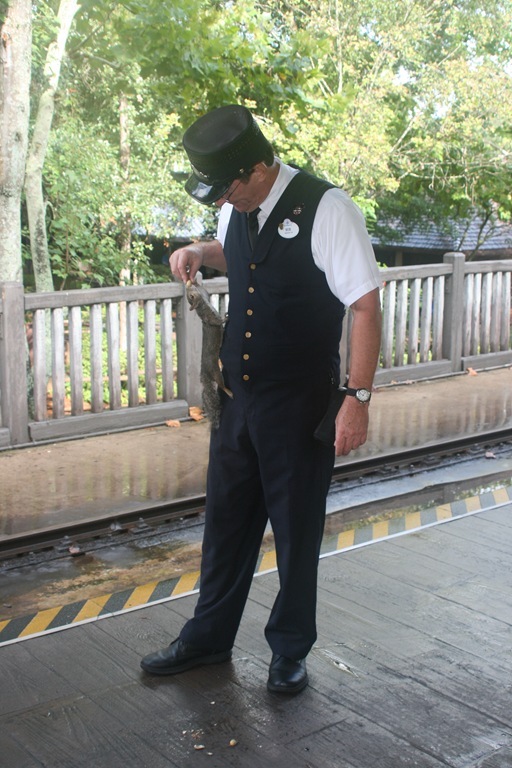 The Disney staff seemed to truly enjoy being there, and there were quite a few that went above and beyond. While waiting for the boys and I to finish a ride at Epcot, Gail saw an impromptu “concert” by some of the cleaning staff, who put a bunch of upside-down garbage cans and buckets together and started drumming on them. They called themselves the “Jammitors”. Also at Epcot, we saw another member of the cleaning staff “painting” surprisingly good pictures of Goofy and Donald Duck on the ground with a wet broom. This was very shortly after the park opened, and he knew full well that the pictures would only last minutes because of the heat, but it was fun for him and guests liked it. It’s not that we had any negative experiences with the Universal staff, and some of the people in Hogsmeade and Diagon Alley did get quite into character, but more often we felt the Disney staff just went that little bit extra. 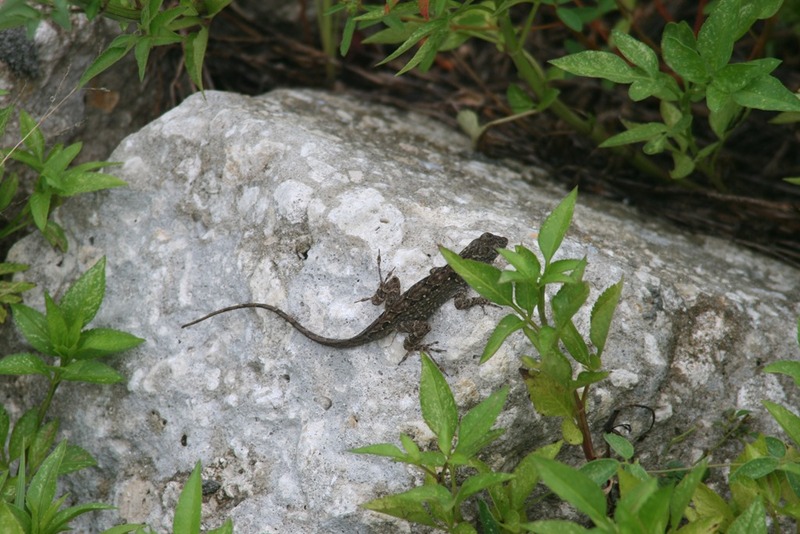 This entry was posted in Family, Florida, Vacations on December 2, 2014 by Graeme. Total pictures and videos taken: 2292 (9.03 GB). About half were on the actual camera, the other half on our phones. We actually filled the camera’s CF card and had to delete a few before we could continue. Should really get a second card. Humidity: roughly 50000% every day. It turns out “humidex” is strictly a Canadian thing, but the American weather reports did have something similar, which I think they called “real feel”. We didn’t check these values often but they were in the low-mid 40’s whenever we did. Apparently the humidex numbers would be slightly higher than this. Number of pounds gained (Graeme): Astonishingly, 0. In fact, a week after we got back I weighed 1.5 pounds less than a week before we left. Number of pounds gained (Gail): Yeah, right. 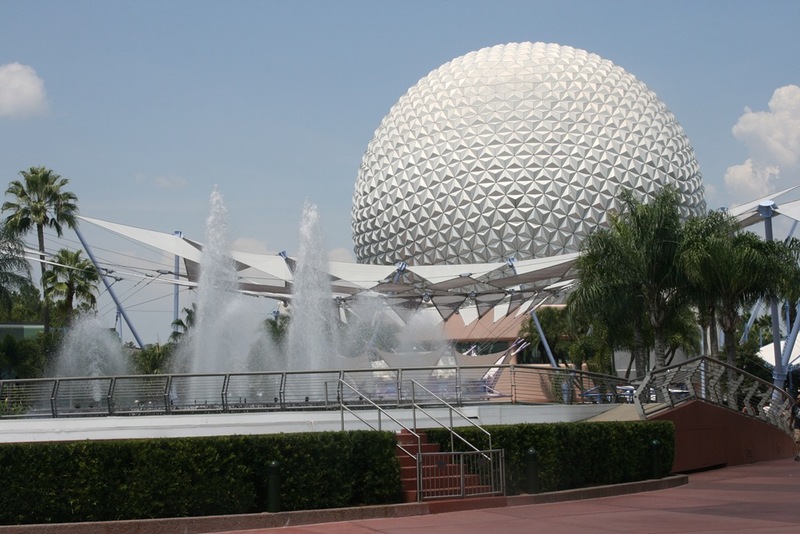 This entry was posted in Family, Florida, Vacations on December 1, 2014 by Graeme.